You might think of a jig saw (or jigsaw) as the Ginsu knife of the power tool world: it'll cut anything—tin cans, nails, plastic pipe—and still be able to make fine cuts in delicate materials such as plywood veneers. 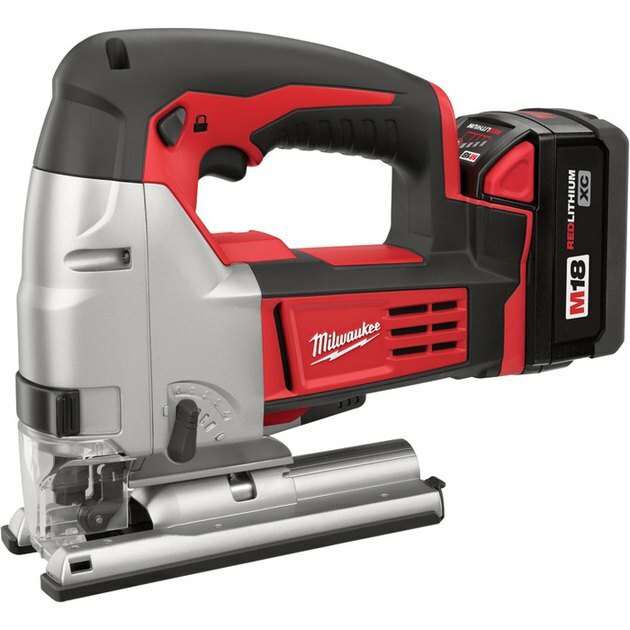 If the circular saw is the king of portable power tools, the jigsaw is the indispensable queen, as it makes all the cuts a circular saw cannot. In fact, a jig saw is even more versatile, and if you plan to own only one power saw and don't need to cut a lot of lumber, a jig saw is likely your best bet. A jig saw is the most versatile power saw you can own. Above all else, jig saws excel at curved cuts. So, for example, if you need to take a solid board and turn it into a puzzle, look no further than the jig saw (and now you know where the puzzle gets its name). This capability is made possible by the jig saw's narrow blade with its stabbing up-and-down (reciprocating) motion. There's very little blade contacting the wood, so the tool is free to make sharp turns without the blade getting in the way. Jig saws certainly can make straight cuts, too, but their freedom of movement means they don't track as well as saws with wider, rotating blades, like circular saws or table saws. To make a long, straight cut with a jig saw, it helps to run the saw along a straightedge (a level, large square, or straight board, etc.) clamped to the workpiece to guide the base of the saw through the cut. While jig saws can't easily make plunge cuts like circular saws can, they're very good for interior cuts— where you're cutting from the inside area of a workpiece rather than from an edge. The trick to doing this is to drill a starter hole—slightly larger than the jig saw blade—through the material just inside of the area you will cut out. Simply insert the jig saw blade into the hole, then start the tool to make the cut. A jig saw has a base that pivots to change the angle of the cut from 90 degrees (straight up and down) to 45 degrees and everything in between. You can also adjust the speed and motion of the blade for different materials and cutting performance. The blade motion can cut straight up and down for a cleaner but slower, cut, or it can have an elliptical, or orbital, motion that reaches out and grabs the wood for a much faster, more aggressive cut. In general, moderate speed and less orbit is preferred for fine or delicate materials and for metals or plastic. High speed and maximum orbit is used for quick, rough cuts in lumber. 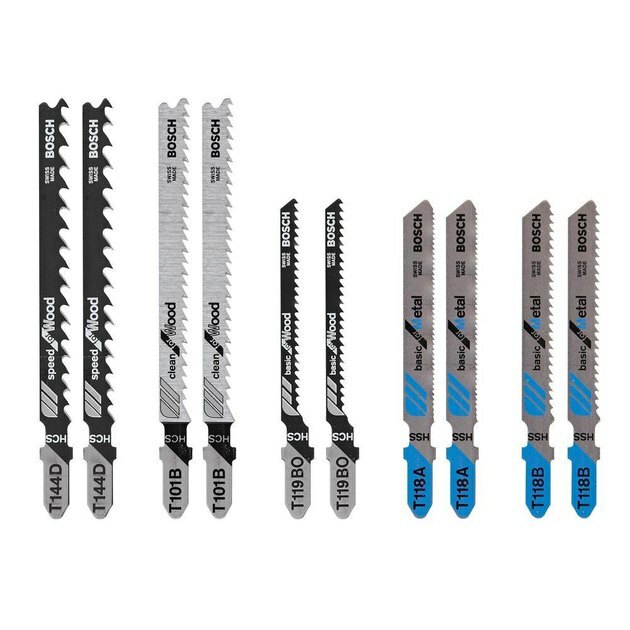 In addition to a speed setting, many jig saws have a variable-speed trigger so you can adjust the speed as needed during the cut. Jig saw with rotating blade and built-in work light. It's the essential question that most tool buyers have to face these days: cordless convenience or old-school cord-and-plug? 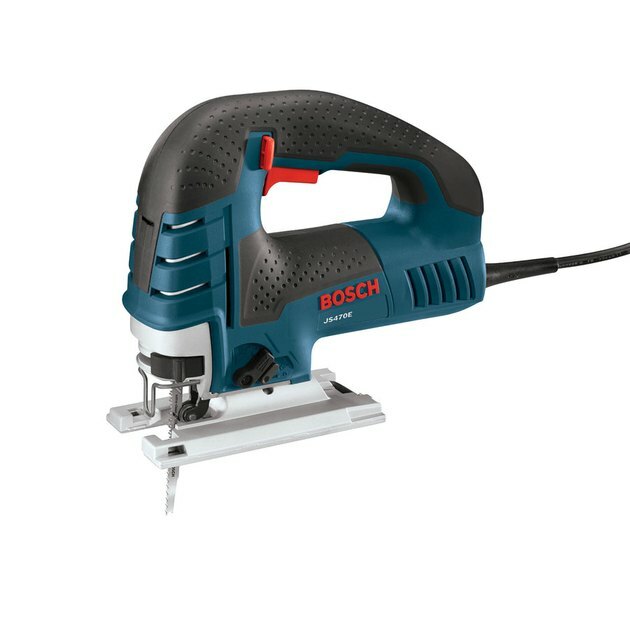 Power is not as important with jig saws as it is with circular saws or miter saws— a fact that seems to favor cordless models, which tend to have less power than corded saws. At the same time, jig saws typically are used around a workbench; you don't normally need them away from power sources, so having to plug the tool in is seldom an inconvenience (although a cord can get in the way whenever you're cutting). In terms of power, corded jig saws are rated in amps and range from about 3 to 8 amps. Tools with 5 amps or more are recommended for heavy use and are best for all-around performance. 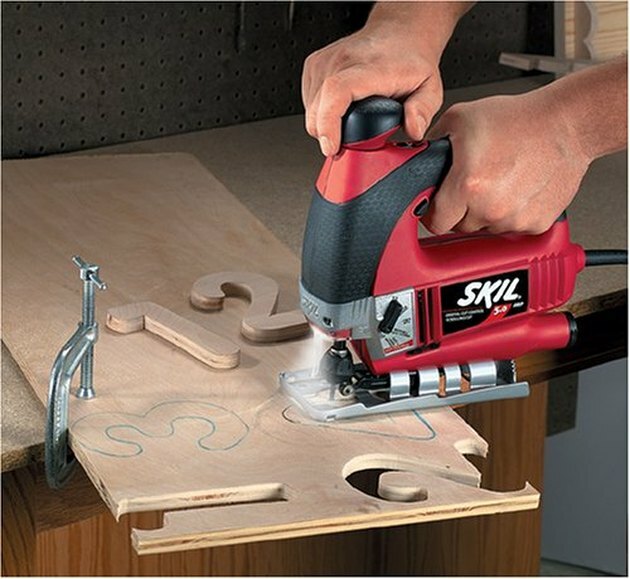 Cordless saws are rated in volts; most jig saws are 18-volt, but there are some 20- and 24-volt models. In general, more volts means more power, but not all batteries or tools deliver the same cutting power with the same voltage (quality plays a role). Also, the life of the battery per charge is a function of amp-hours, not voltage. So look for batteries with higher amp-hour ratings if you want the saw to keep going for as long as possible between battery charges. Pay attention to what you're buying when purchasing cordless tools, especially from online retailers. A great price on a cordless jig saw may not look so great once you realize that you are buying only the tool body, not a battery and charger. And you may want to make that all your cordless tools are from the same manufacturer family—this will allow you to swap batteries between them, giving you much more flexibility. Like circular saw blades, jig saw blades cut on the upstroke, as the blade pulls up through the material. This results in splintering on the top face of the workpiece. So the usual tactic is to place the good side facing down when making cuts. If the blade says "reverse-tooth," it cuts on the downstroke, so that splintering, if any, is on the bottom side of the workpiece. Note that blades must be compatible with the saw. For example, Bosch saws use a "T-shank" quick-change system that accepts only T-shank blades. Wood and bi-metal jig saw blades. Standard wood blades have coarse teeth for quick, if not terribly clean, cuts in lumber, plywood, and most other wood products. Fine-tooth wood blades are a must for fine woodwork and for plywood cuts where you want minimal splintering. Metal-cutting blades have fine, hard teeth and are similar to a hacksaw blade; use these for all cuts in metal and for fragile plastic, such as Plexiglas. High-quality versions typically are "bi-metal," meaning they have hard, high-speed-steel teeth bonded to a more flexible metal blade for better cutting performance and durability. 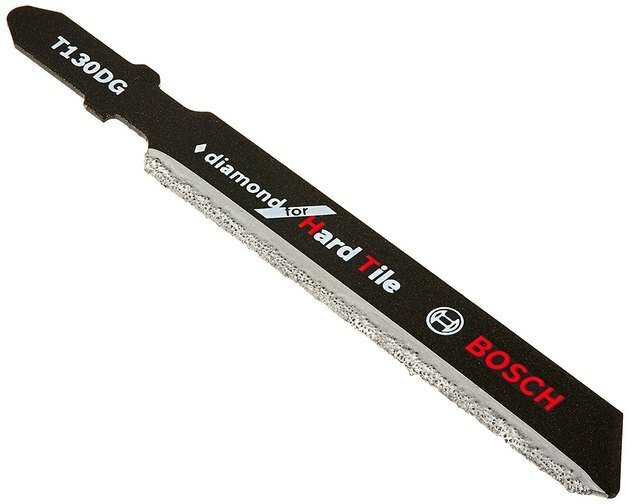 Diamond-grit blades make clean cuts in ceramic or porcelain tile, natural stone, glass, and cementboard. Laminate blades are reverse-tooth blades that cut on the downstroke. This is essential for cutting plastic laminate countertops, which would easily chip with a standard blade. Laminate blades also are designed to work well on laminate wood flooring. Offset, or flush-cut, blades are extra-wide so the cutting edge extends out in front of the saw base, allowing you to cut all the way up to a wall or other abutting surface without the base of the saw stopping you short.